Volunteers are starting to excavate one of Cornwall's historic sites linked to the county's patron saint. 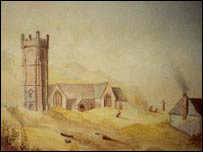 St Piran's Church near Perranporth is partially buried in sand dunes. A four-week project led by Cornwall County Council is under way to expose the church, believed to date back to the 12th Century. The dig is part of a major programme of works at scheduled monuments across Cornwall and the Isles of Scilly over the next two years. Thousands of people march across the dunes each year to the site to celebrate the saint's life.